After saving up for so many months, you finally have a brand new phone. It’s the latest model, and it’s sure to be the envy of your friends. The only problem is, you don’t have enough money to fund your calls and text messages to your ever-growing number of contacts. Suddenly, the guy with the ratty old Nokia from the mid-2000’s who seems to have an endless source of load looks a lot happier compared to little ol’ broke you. Is there a way to get more call and text messaging credits and perhaps Internet access without spending a lot? UNLI is short for unlimited, as the catchy name of this promo implies, and for as little as 25 pesos, you can make unlimited calls and unlimited texts to other Globe subscribers for one day. You’ll also get free 1-day access to Facebook, plus an app of your choice. Choose from Twitter, Instagram, Google, Yahoo, Viber, Foursquare, or WeChat. No Wifi is needed to access these sites. For an additional 5 pesos, you can choose two more sites to access, just pick from Tumblr, Yahoo, Google, Viber, Foursquare, or Snapchat. If you want unlimited 1-day access to 5 sites, simply add 10 pesos and choose from Sulit, Instagram, Yahoo, Google, Viber, Foursquare, WeChat, Kakao, Snapchat, or Pinterest. This is the perfect promo to subscribe to on a weekend, when you can surf, text and call all the live long day. To register, dial *143# and choose GoSAKTO. This promo is good until May 31, 2014 only. If you need to stay connected via chat apps, then this is the promo for you. For 30 pesos, you get unlimited calls and texts to all Globe and TM subscribers, plus access to the best chat apps for one day. Now you can call your family and friends abroad using Viber, enjoy IM conversations via Facebook Messenger, send animated emoticons with Kakao, and leave voice messages with WeChat. To register, text GOUNLI30 to 8888. What would you if all your friends are subscribed to other networks? Well, you could ask them to switch, or you can subscribe to the ALL NET 25 promo. For one day, you can have unlimited texts to all networks, plus 75 minutes of calls to Globe or TM numbers. You also get 5 minutes of free calls to other networks, plus 5MB of Facebook. The ALL NET promo comes in other amounts, so take your pick from ALL NET 70, ALL NET 200, ALL NET 300 and ALL NET 500. The 500 comes with unlimited texts to all networks, 11 hours and 50 minutes free calls to Globe or TM numbers, 20 minutes of calls to other networks and 10MB of Facebook, good for 30 days. To register, just text ALL NET 25 (or whatever amount you like) and send to 8888. If you want longer talk time and you want to lay off texting for now (in case you’ve got carpal tunnel or texter’s thumb), this is the perfect promo for you. GoCALL 100 gives you 500 minutes of consumable calls to Globe or TM numbers, and it’s valid for 7 days—all for the price of a hundred pesos. To register, text GOCALL100 to 8888. Ever wished that you could have a landline that you could take with you at all times? Yes, you’ve got your mobile, but sometimes you need to make important business calls or just call up your family on the landline just to check that everyone’s home and safe and sound. Well, now you can with the SUPER DUO promo! Once you register to this promo, you’ll get a SUPERDUO landline number, so your mobile phone will now have two numbers, which is your current mobile number, and your SUPER DUO landline number. If you’re using a prepaid number, you’ll need a minimum load balance of 599 pesos to subscribe to the service. To register, simply text SUPERDUO <area> 599 to 8888 and wait for the service confirmation. This service auto renews every month, so make sure that you have sufficient load before the month is over to continue the service. Let’s say you work in Manila, but your family lives in Cebu, and you’d like to be able to call them on the landline as often as possible. With the DUO promo, you can. Just like in the SUPER DUO promo, you can use your mobile to make unlimited calls to other DUO or SUPERDUO numbers, Globe landlines, and other landlines in 66 areas nationwide. This promo is good for 30 days upon registration and costs 450 pesos. To register, text DUO <area> 450 to 8888 and wait for the service confirmation. Do you know someone who seems to be constantly texting, and maybe he’s gotten so good at it that he doesn’t even need to glance at his phone while he’s doing it? That person is a certified Kitikitext, or a texting aficionado. 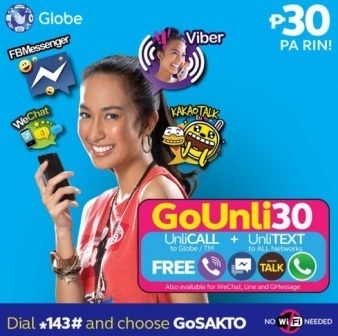 He’ll certainly love the GoUNLI49 promo, good for unlimited texting to Globe and TM numbers and is valid for 7 days. It costs only 49 pesos, making it one of the cheapest unlimited texting plans ever. Dial *143# and choose this promo to register. Got only a few coins to spare for load? The SULITXT 15 promo is probably the most inexpensive of all the existing Globe promos to date. For only 15 pesos, you get to send 100 text messages to other Globe or TM subscribers for one day. You can register by texting SULITXT15 to 8888. For only 20 pesos, you can forward jokes, quotes, or even share details of your day’s highlights with your family and friends. With UNLITXT, you can send unlimited text messages to Globe or TM subscribers all day and night. Text UNLITXT20 for 1 day of unlimited texting to 8888. Or, you can choose longer UNLITXT plans. UNLITXT 40 costs only 40 pesos and is good for 2 days of unlimited texting, and UNLITXT 80 costs 80 pesos and is valid for 5 days of unlimited texting. Most of these promos do not auto renew, so you will have to re-register as soon as your chosen promo expires. Please note that you cannot register to a promo if you are still currently registered to another promo. Some promos will require that you should have at least 1 to 5 pesos remaining credit after registering, so having a little more than the required amount of load for the promo on your phone is recommended for your chosen service to be activated. You can purchase load from electronic loading stations in stores, or get them online from Morbie.com. For other promo codes, we created an EPIC post of promo codes for Globe, Smart, Touch Mobile, Talk n Text and Sun Cellular that you can use to make the most out of your credits. Hi, do you have an 2018 updated list Prepaid Promos from Globe? I hope you could help me. Thank You! Truly when someone doesn’t know then its up to other users that they will help, so here it happens. Thank you po sa post.